Titanic was an Olympic-class passenger liner that became infamous for her collision with an iceberg and dramatic sinking on April, 14 1912. The second of a trio of superliners, she and her sisters were designed to provide a three-ship weekly express service and dominate the transatlantic travel business for White Star Line. Built at the Harland and Wolff shipyard in Belfast, Titanic was the largest passenger steamship in the world at the time of her sinking. During Titanic's maiden voyage (from Southampton, England; to Cherbourg, France; Queenstown (Cobh), Ireland; then New York), she struck an iceberg at 23:40 (ship's time) on Sunday evening, April 14, 1912. She sank two hours and forty minutes later, after breaking into two pieces at the aft expansion joint. Titanic was designed to compete with rival company Cunard Line's Lusitania and Mauretania, luxurious ships and the fastest liners on the Atlantic. The Titanic and her Olympic class sisters, Olympic and the upcoming Gigantic, were intended to be the largest, most luxurious ships ever to operate. (The planned name Gigantic was changed to Britannic after the disaster.) The Titanic was designed by Harland and Wolff chairman William Pirrie, their head designer Thomas Andrews, and general manager Alexander Carlisle, with the plans regularly sent to the White Star Line's managing director J. Bruce Ismay for suggestions and approval. Construction of the Titanic, funded by the American J.P. Morgan and his International Mercantile Marine Co., began on March 31, 1909. The Titanic No. 401 was launched two years and two months later on May 31, 1911. The Titanic's outfitting was completed on March 31st the following year. The Titanic was considered a pinnacle of naval architecture and technological achievement, and was thought by The Shipbuilder magazine to be "practically unsinkable" With a double-bottom hull, containing 44 tanks for boiler water and ballast to keep the ship safely balanced at sea (later ships also had a double-walled hull). Titanic also exceeded the lifeboat standard, with 20 lifeboats (though not enough for all passengers). Designers had discussed adding more, depending on storage issues. Furthermore, she was divided into 16 compartments by doors held up in the open position by electro-magnetic latches, which could be closed by a switch on the ship's bridge. In 1995, the builders of Titanic, Harland & Wolff of Belfast, Northern Ireland, approached Fine Art Models to build the builder’s model of Titanic. There had never been a builder's model of Titanic built and therefore, no one ever knew what the ship really looked like. 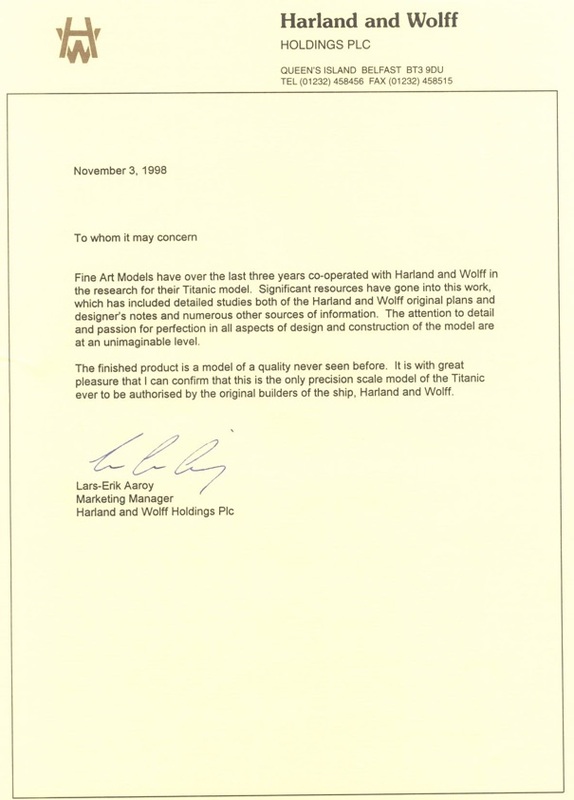 Harland & Wolff had looked for many years for someone to document the ship and finally came to Fine Art Models because of all the awards our models had won worldwide. They offered us the opportunity to document the ship with their total cooperation. With fifteen trips to Belfast and two years of research, only then were we ready for the design phase. Fine Art Models was given access to original plans, drawings and every photograph of Titanic known to exist. In addition, we were given a copy of the designers notebook detailing every change in Titanic from its sister ship the Olympic. Additional needed reference came from museums around the world as reference for outside acquisitions such as deck blowers and vents were not found at Harland & Wolff. Fine Art Models began their development in late 1995 and, only in December 1998, was their first 1:192 scale model complete. The 1:48 scale builder’s model, completed in 2002, took a total of seven (7) years to build – longer than it took to build Titanic herself. One very import fact surrounding this model is that by agreement with Harland & Wolff, this model would never be displayed with the artifacts (plunder) brought up from the Titanic gravesite. Furthermore, the exhibit of this model would never be seen as an effort to profit from this tragic event. The model was introduced by National Geographic at Explorer's Hall in Washington, D.C. and has traveled to museums and charitable events across the United States. Most recently it was featured at the National Geographic, once again, for the100th anniversary of Titanic. The model is over 18 feet long. using more than 3,376,000 rivets, composed of three (3) different styles. Every bulkhead is in its proper location. The entire superstructure is constructed of brass. The model weighs 1,500 pounds. The decking is real wood, as is the deck furniture, which is crafted to exact proportions. All exterior windowed rooms are to scale, including the furniture and décor inside each room. The telegraph in the Bridge is internally lit. Its lighting is so complex that it required the installation of more than 8 miles of fiber optic cable. The wood case took two (2) craftsman two (2) years to build. Harland & Wolff for all builder’s model cases. Each side holds a single piece of glass, to not obstruct the viewing of the model. The glass was made in England, the only place that could make glass this size. Each (long) side of glass weighs 1,000 pounds. Overall measurements of the Titanic in it’s case: 22’ long, 52” wide and 9’ high. Estimated weight is 5,500 lbs.